Konichiwa! We are adjusting to our time zone in Japan and still have one more plane ride before we make it all the way to Okinawa but so far we have had a great trip. Let’s get down to business. 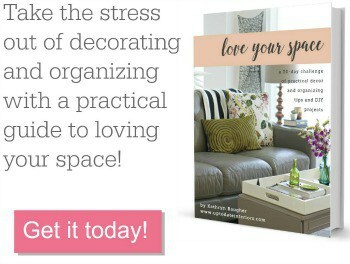 Today’s love your space challenge is for practical and pretty storage in your bedroom. I love having an upholstered piece of furniture in the bedroom. Using a storage bench or cubes in the bedroom provides seating and extra space for out of season clothing or linens. If there isn’t enough space for an additional piece of furniture, baskets are a great space saver and still look nice.